Limited production Pinot Noir featuring hand-harvested fruit. Working under the guidance of renown winemaker Paul Hobbs, we select clones of Pinot Noir that exemplify the rich minerality, soils and cool weather of the Sonoma Coast, resulting in a beautifully balanced wine, enhancing every meal. Vineyards: Peterson Vineyard and Yellow Rock Vineyard. Located in the Petaluma Gap region of the Sonoma Coast. Soils consisting of Coastal sandy loam. winemaking: Hand harvested grapes. Fermented with native yeast. Extented period of cold soak and macreation. Hand-punched cap. Native malolactic fermentation in barrels. Aged 9 months in Damy, Francois Freres, Radoux, and Cadus French oak barrels; 50% new. Light red fruit, cranberry, raspberry, dried fruit/herbs. Slight aroma of vanilla cream from oak, good acid, medium bodied, bright fruit and finish. Crisp earthy undertones and terroir. A lifelong thrill for backyard harvest-to-table farming, discovering fine Burgundies, and joining with family and friends for long meals around the table kept us satisfied until we could no longer look away from the unique potential of our greater backyard, which nurtures some of the most prized Pinot Noir vineyards in the New World. Winemaking came to us naturally, as a deep expression of our unique time and place. "Great wines begin in great vineyards. Each season as I walk the vineyards I realized how our wine exemplifies the intersection of the true potential of Gap’s crown, our clones and passion for winemaking. As the growing season progresses my constant vigil of walking the rows and monitoring the progress of the vines helps us to determine the perfect moment to harvest our fruit." 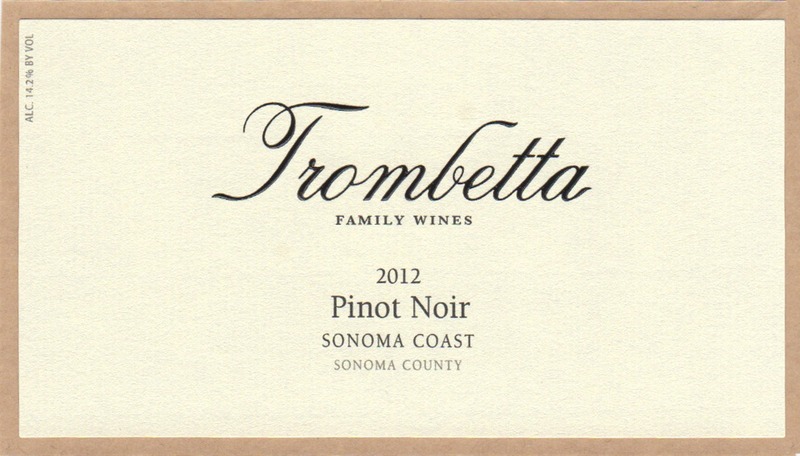 Trombetta Family Wines first vintage of Pinot Noir is from the GAP'S CROWN VINEYARD located on the western slope of Sonoma Mountain. We have selected three clones of Pinot Noir that we feel exemplify the rich minerality, soils and cool weather from the Petaluma Gap. This vineyard is pristinely maintained. At harvest, Rickey works the night picks alongside the crew. Armed with blue shop towels, she ensures that each macro bin is clean and dry before the fruit arrives. Leaves are painstakingly pulled along with any botrytised fruit. Although slightly warmer than 2010, the 2011 season was recorded as a cool growing season with extended hang time. Lower than average fruit meant extra vigilance in the vineyard in order to determine the perfect harvest date. On October 2, we began harvesting at 1a.m., working quickly to load the truck before rain-- which would last for 2 days -- began to fall around 7 a.m.
2010 was a cool year with a heat spike towards the end of the growing season, giving the Pinot Noir a long ripening period and time for the grapes to develop. The fruit set was well balanced in the vineyard, and a close eye was kept for ideal harvesting parameters as the season drew to a close.